first one is I have no patience and I am not a perfectionist. I know you don't really have to be a perfectionist..but I am not even close..well that is because I have no patience. Another bad habit. I never pay attention to where the starting thread is. So it usually ends up being a jumbled mess at the start of my fabric. I am working on trying to remember to straighten out the threads. Another bad habit. I hate to iron. I know that in quilting irons are my best friend. Could be my iron keeps shutting off...time for a new one. Another bad habit. I can't sew straight to save my life. I just purchased a 1/4 inch foot to help. 1/4 inch foot really helps. Iron is my friend and iron those seams. Now if I can just remember the above and not stretch the minky I am putting in the baby quilt. I will be happy. Good luck, those are the same habits we all have...lol. Mine is not squaring. Have learned the iron helps and that nasty starting thread. Cannot get in the habit of using a leader and that would work wonders. Everyone has to "iron out" their habits to begin quilting. It is just a fact of life for all of us. No matter though, because the new habits you are forming will serve to make you happier when sewing any type project in the future. 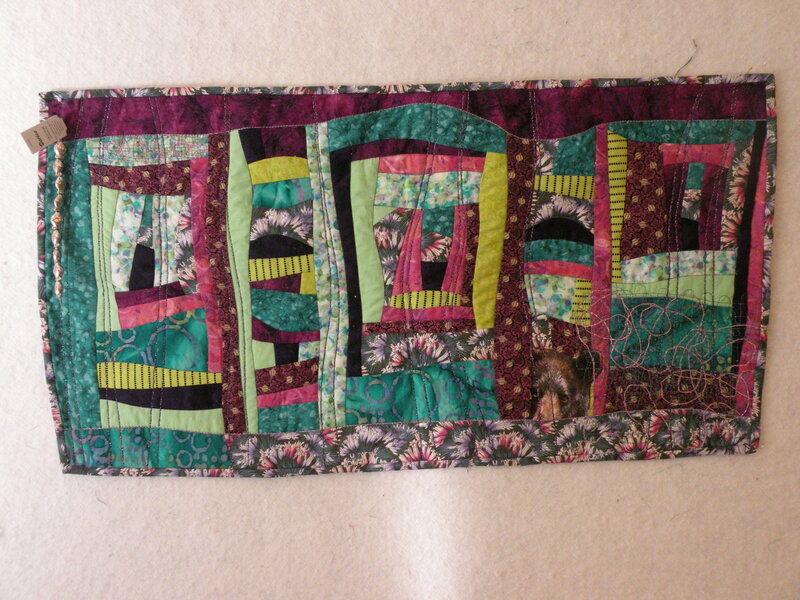 When I look back on my first quilting projects, I cringe wondering how I even was able to finish them at all. (This was so long ago there wasn't even rotary cutters and very few instructions available to learn!) Cereal boxes were our templates and a number 2 pencil outlined onto the fabric were eyeballed cut out to the quarter inch seam allowance with a large pair of sewing sissors! Oh yes!! That was how it was done. I think you are so smart to learn new habits. You go girl and happy quilting! I hear you - after making several quilts I'm not thrilled with - I've learned to square and just take my time - that patience thing! Good luck in making new "good" habits! To avoid thread nests on back of piecing check out WWW.quiltville.com. This is Bonnie Hunter's site and under her Tips and Techniques she explains using leaders and enders. This method gives you half of a four patch block. The easiest way to fix this problem is to sew onto a scrap of fabric when you finish with a seam, then sew from the scrap to your next piece. It's like chain piecing, but the scrap is the last piece. Many people do this. I think it saves time because I don't have to mess with finding the loose ends, worry about tangles or trimming loose threads and I think I use less thread because I'm only sewing a couple inches rather than pulling thread to the thread cutter on my machine. I've heard several terms for them. I used to call them leaders, but now I call them headers and footers (like the word processing terms, because they are at the start and finish of the seams). I use to sew fast, zipping through chain piecing and kept wondering why my blocks never were true square, always some edges short or longer. I learned to sew slow, feeling and eyeing the fabric edges as I go. It has made a big difference. If the edges of my blocks or strips are out by 1/16th I know something is not right. I find the problem and correct it. A few time doing this and I know what to watch for and prevent. It may take longer but once done, my quilt top goes together perfectly. Having every seam match and laying flat is a good feeling of accomplishment for me. I found a nifty little thread helper. A command strip on the machine bed will hold the thread tails out of the way when you start to sew. Last edited by BellaBoo; 06-14-2013 at 07:35 AM. My bad habit is not being able to keep blocks lovely and flat when tranort ing to class. A shaky hand which spills coffee onto fabric. Not panicking when seams etc don't match. Trying to go slower because quilting is so expensive at at least 1 quilt a week. I have some of those same habits and am very impatient. I want it done when I start. I have a problem when things start to go wrong I get so frustrated I start I start making all kinds of mistakes and I just want to throw it all away. I have been sewing for to many years to count and I am setting here now trying to cool down after making the stupidest mistake on the most simple little girls dress. When I get myself calmed down it is a take it apart and redo. I had my mind on the quilt I want to start when I finish some dresses I am making for my DGD's birthday next weekend. Your lack of patience which leads to the bad habits will eventually teach you -- as it appears it already is teaching you -- that you'll just get frustrated and/or have do it over, which takes longer than doing it well in the first place. Mostly, mistakes are the best teachers anyway, so you'll learn one way or the other, take heart! Patience is a virtue, one of which I don't have so I make due with what I've got. I walk away for awhile. My iron sits to the side of me where that little red varmint likes to hang out. You have to click on her blog to find the Tips and Techniques link, it's not on the quiltville site but the blog link is. Hi Steph, love your post. My "bad" habit is I like to iron. Sometimes I think I iron fabric out of square and change how my blocks fit together. It's all good though. Sometimes haste does make waste. Do-overs really don't save any time at all. Ok, silly question here. Where do you put the strip so it's not in the way?
" I have some very bad habbits "
I hate slowing down to match corners, so I avoid making corners that need to match. And when I make a mistake I ask, "Can you see it 10 ft away on a galloping horse? No? It's fine." See any mismatched corners or oops? Yes?! !, Then you're too close, step back and take another look. I put mine in the back of the needle to the left about 3 inches. It has never been in my way. Or....you can go the other way and be crippled by fears of imperfection (ask me how I know ). Thanks Jan for being a Mother Hen to us all. StephT I like yourself had sooooo many bad habits ( but not really bad, just inpatient) that now that I have more time to make quilts, I've been reading a lot of the threads on this board. I have started to listen. ( I am not a person who can be told what to do). So I've learned that heavy starch is a necessity to better squaring up and less stretch. Also there are no quilting police. So If I love it, that's all that matters, but I'm slowly, and mean that literally, slowly starting to take many of these ladies advise on how to be more professional in my quilt making verse Just Making A Quilt. DottyMO, try putting your blocks in a clean pizza box. I have a variety of sizes just for that purpose. They stay clean, ordered, and usually not wrinkled. I, too, am friendly with the lack of patience, not-so-straight seams, etc. But just hang in there and make good habits and use them always. 1 cut finger is a wonderful reminder to always close your rotary cutter, etc. What is a command strip??? Please tell us!!! To keep quilt squares flat: The 12" square by about 2-3" high plastic boxes with handles on them work great for storing finished quilt squares until you're ready to put them in a quilt. Another method is to wrap them around a empty tube from paper towels or wrapping paper. I also have a pattern using a tube and some fabric to wrap them in too. It was one of our quilt guild programs. When you see how much benefit it is to use a small piece of fabric in which to take your first four stitches, it will be no trouble to develop that habit. It saves a great deal of trouble with thread nests.